It’s Tuesday again, which means we have new releases and there are definitely a couple big records coming to record stores near you today. The first shoutout I’m giving is to Fiona Apple, a bluesy singer whose new album, The Idler Wheel Is Wiser Than The Driver of The Screw and Whipping Chords Will Serve You More Than Ropes Will Ever Do (boy, that is quite the title), which came out today, is apparently the best thing since sliced bread, excuse my use of clichés. So far, I’ve listened to the first track, “Every Single Night” and it really blew me away. Definitely check this out if you liked Adele’s 21. The next big release, and this one had more build up and hype to it, is Smashing Pumkins’ Oceania, the full-form LP in the long-term, continuous Teagarden By Kaleidescope project. What I heard of it sounded quite good, though I have yet to give the record a thorough listen. It too is receiving rave reviews. Now, I’m going to mention this next record, simply based upon the fact that it is #1 on the charts, though I am by no means recommending it. The dream boy of our generation, Justin Bieber, has released a new album, Believe, whose lead singles, “Boyfriend” and “As Long As You Love Me,” have already been graced with significant popularity. And that’s all for today, folks. The Beach Boys, Californian 1960s pop-rock group who competed for the charts with The Beatles in their heyday, finally returned after a long period of various hiatuses, breakups, deaths, lawsuits and turmoil. On June 5, 2012, remaining Beach Boys, Brian Wilson, who first formed the band in 1961 with his brothers, Dennis and Carl, and his abusive managing-father, Murry, founding guitarist and singer Al Jardine, founding singer and cousin of the Wilson brothers Mike Love, long-absent guitarist and singer David Marks, and singer Bruce Johnston, released their first record of new material in twenty years. 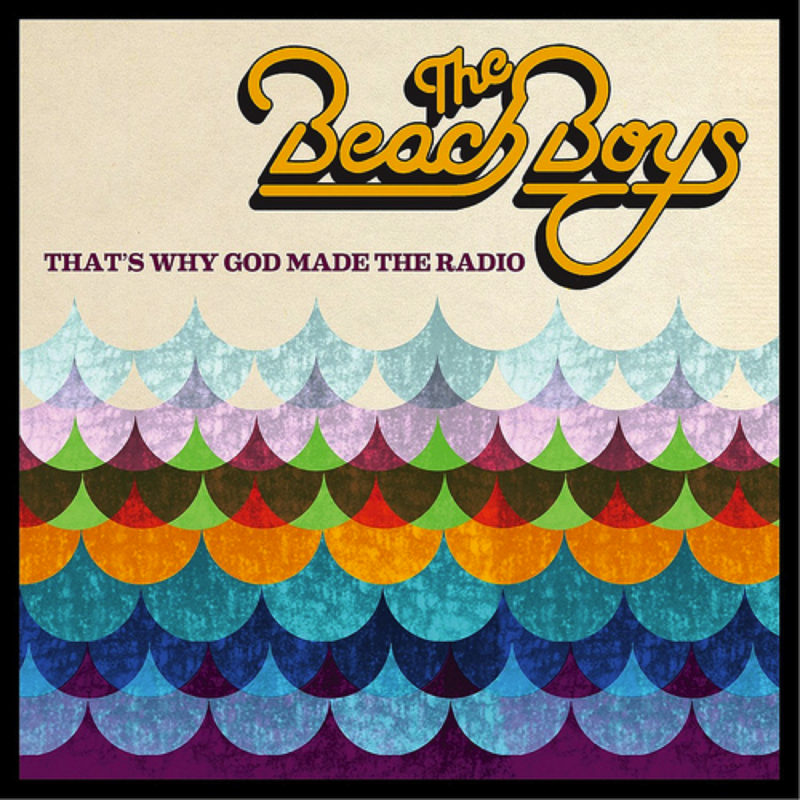 That’s Why God Made the Radio feels like 1965 all over again, with its classic Beach Boys harmonies, and its shallow, happy-go-lucky, fun-in-the-sun thematic content. The record kicks off with a gorgeous instrumental, “Think About the Days,” and often, brief interlude tracks of this kind can seem like filler, though That’s Why God Made the Radio’s opener is totally necessary. It also sets the tone for the album: lots and lots of harmonies (sometimes they even tend to overwhelm a bit), perfect studio production, and peppy, light music, brilliantly composed mainly by Wilson and Love with help from the other Beach Boys as well as some outside help from Jon Bon Jovi and Jim Peterik of “Eye of the Tiger” performers, Survivor. The next few tracks, “That’s Why God Made the Radio,” the lead single, which leaked onto the internet on April 25, 2012, “Isn’t it Time” and “Spring Vacation” are the strongest on the record. The lead single is especially wonderful and lives up to the legacy of classics like “Surfin USA” and “Wouldn’t It Be Nice.” Though it is difficult to credit the Beach Boys with being brilliant poetic lyricists, the lyrical content on these three tracks is the strongest. Perhaps, the appeal of these early tracks is partially because the album becomes redundant about halfway through. The Beach Boys have one style and hearing the same harmonies, the same chord progressions, the same song structures takes away very slightly from the overall qualitiy of the record. Every song on the record, nonetheless, is single worthy, just like almost every Beach Boys track ever released. It is incredible that the Beach Boys were able to make a record so nostalgic and classic-sounding in the year of the their 50th anniversary. Lastly, the album is a fun, easy listen, and it lives up to past releases. Definitely give That’s Why God Made the Radio a good, solid listen, keeping in mind that these guys are all well past sixty years old, some as old as 71. Knowing that, and remembering that you cannot hear their age in their vocals, That’s Why God Made the Radio is all it could and should be: a fun, Summery, Beach Boys album that sounds like every other Beach Boys album. Lie down on a beach or a sun-washed field somewhere, close your eyes, and just allow the joy of these happy tunes to wash over you. I’m good for my word. Here’s the second installation of The Sound Hound’s “New Release” section. This is another pretty solid week. The Holy Trinity, A.K.A., Rush (Geddy Lee on vocals, bass and keyboards, Neil Pert on drums and Alex Lifeson on guitar) have blasted back into the record stores with their 20th (yes, 20th!) studio album. Like a lot of more recent Rush material, the musicianship on Clockwork Angels, is extremely tight, genius and perfect, though the lyrics (iTunes refers to them explorative) in my opinion, leave a bit to be desired. If you can get past that (I can), then check out the power of Rush. Grace Potter and the Nocturnals came out with their follow up to the smash eponymous record with the hit “Paris (Ooh La La), The Lion the Beast the Beat and it’s filled with slower, softer tunes less like “Paris” that still show off Grace’s incredible vocal talent. Jimmy Fallon’s newest, Blow Your Pants Off, is a compilation of original tunes and goofy covers of pop-songs performed by Fallon while he impersonates famous artists, a prime example of which being “Whip My Hair Back and Forth,” originally performed by Wilo Smith, though on Fallon’s album, is by “Neil Young” and the actual Bruce Springsteen. His other work is quite good as well. Be sure to check out “The History of Rap (feat. Justin Timberlake), and really anything on this album. It’s a solid release. Matchbox Twenty dropped the first single of their newest album, North, MB’s debut since 2007. The single, “She’s So Mean,” resembles classic Matchbox and I look forward to hearing the rest of the record. Mixtape rappers Tayyib Ali and Luke Bahta both dropped singles recently called, “Dreaming” and “Living” respectively. Both tunes are stellar. Today marks the day of a new category, segment, or whatever you’d like to label it on The Sound Hound. Typically, every Tuesday, new music hits the record stores and I’ve always valued getting a heads-up about a new release, so from now on, every Tuesday, (or every Tuesday worth mentioning) I will let you all know about new releases: what’s come out, what to check out, releases that have peaked my interest and so on and so forth. First and formorst, check out the newest release by The Beach Boys, That’s Why God Made the Radio. You’ll be blasted back to 1965–it’s like the Beach Boys never left! This is probably the biggest release of this week, so definitely give this one a listen. ZZ Top have returned with a 4-song EP, Texicali (very surprising title, boys). It certainly sounds more like their terrific Eliminator and Tres Hombres music rather than the trashy stuff they’ve released recently. Patti Smith dropped her first studio album in eight years on June 1st, Banga. The soundtrack for the upcoming movie, Rock of Ages features covers of songs by Guns n’ Roses, Foreigner, Bon Jovi, Def Leppard and lot’s of other 80’s hair metal songs by actors including Tom Cruise. The best part is these covers actually hit you hard. Tom Cruise has pipes! On that note, Def Leppard rerecorded a “Pour Some Sugar on Me” and “Rock of Ages” and released them on Pour Some Sugar on Me/ Rock of Ages 2012 (Re-Recorded Versions) – Single. Garage-rock group from Sweden, The Hives, dropped their first full length release, Lex Hives, in five years and they actually just played a big show at Coachella in California. Joe Walsh, ex-guitarist of The Eagles, released his well-anticipated solo album, Analog Man. The album won’t surprise you–it sounds like music Walsh would write, country rock, somewhat reminiscent of The Eagles’ work. This was a pretty big Tuesday and I can’t offer that for every Tuesday but I will try to compile a good list as often as I can. I wanted to do this two weeks ago, but for the past two weeks, there have been very few major releases save for John Mayer’s Born and Raised, which is definitely worth a listen. Let me know what you think about these releases (again, I’m not necessarily recomending them, but they all intrigued me) and if I missed anything. It was a hot day in Asbury Park, New Jersey on the Boardwalk and the sun bounced off the clear, blue ocean. Never Shout Never, an “emo punk” band from Missouri finished its set on the Main Stage of the 2012 Bamboozle Festival when they announced that the next band, The All American Rejects, would be arriving shortly. The crowd went wild, but got even crazier when AAR singer and bassist Tyson Ritter actually ran onto the stage energetically, followed by guitarists Nick Wheeler and Mike Kennerty and drummer Chris Gaylor. The Rejects opened with one of their biggest hits, “Dirty Little Secret,” off their 2005 album, Move Along, the title track of which they later performed. In addition to those two smash songs, the Rejects also played their breakout tune, “Swing Swing,” as well as “My Paper Heart” from their eponymous debut album and several songs from their newest release, Kids in the Street, before closing with “Gives You Hell,” their chart-dominator from 2008’s When the World Comes Down. The next band to take the main stage was Jimmy Eat World and admittedly, I had never given this group a good listen before seeing them that Saturday. Jimmy was equally as tight as The Rejects and perhaps slightly less experimental. They utilize the verse-chorus-verse format religiously and each song’s hook seemed catchier than the last. It all led up, of course, to their closer and biggest hit, “The Middle,” off the band’s breakthrough album, Jimmy Eat World/Bleed American, whose catchy chorus, “It just takes some time/ Little girl you’re in the middle of the ride/Everything, everything will be just fine/ Everything, everything will be all right,” got every single member of the audience, (including me. Yes, even I recognized the tune) singing, dancing and leaping from the sandy floor. Aside from “The Middle,” I was unfamiliar with every Jimmy Eat World song, though I found myself jumping and pumping my fist in time with the music again and again and again. Other highlights of the set were “Bleed American” also off Jimmy Eat World/Bleed American and “Big Casino” from 2007’s Chase this Light. One of the best parts of a festival experience is the ease in discovering bands with whom I was previously unfamiliar. I’m sure it was difficult to tell that I’d never heard half the songs performed that day based on my enthusiasm, excitement and involvement in the overall scene. It seems that every time I’ve seen My Chemical Romance in concert, the band has been unfortunate with regard to the audience, the sound quality and coincidentally enough, their relationship with Blink 182, the Californian power-punk trio, whose music has defined a generation of summer fun. As I posted about a year ago, I saw MCR open for Blink 182 on the Honda Civic Tour and although the two bands are often paired together, their fan bodies are almost opposite. Right before the Bamboozle Festival kicked off this year, Blink 182, who filled Saturday’s second headlining spot under the Foo Fighters, cancelled several tour dates “…due to a medical emergency. Blink 182’s drummer, Travis Barker, required an urgent tonsillectomy with a recovery period expected to extend beyond the scheduled tour dates.” My Chemical Romance was thus called upon to replace the Californian trio and many of the people in the crowd had been unaware of the change before arriving. Thus a wave of disappointment and in some cases anger washed across the beach. I have decided that I’m not the biggest fan of MCR’s live performances as, once again, I was somewhat deterred by the setlist as well as the poor sound quality. As a fellow Bamboozle-goer who sat next to me on the train home put it, “MCR’s sound guy should be shot.” Though this is extreme, for the first two songs, the opener, “I’m Not Okay,” and the Metallica-esque tune off the same album, “Thank You For the Venom,” singer Gerard Way’s vocals were difficult to hear over the rhythm guitar, though this issue was solved by the third song, The Black Parade’s “Mama.” Lead guitarist Ray Toro’s solos were difficult to hear over the other instruments, though interestingly enough, his rhythm guitar playing was louder than rhythm guitarist Frank Iero’s playing. On a more positive note, from a musical perspective, it is quite evident, that every member of MCR, minus the newest drummer, is a talented musician. Nonetheless, My Chemical Romance aren’t the greatest live band and should certainly only be seen as a headlining act. And then, finally, after years of failing to snag tickets and wishing I was at their show, I watched singer and guitarist Dave Grohl, drummer Taylor Hawkins, bassist Nate Mendel, lead guitarist Chris Shifflet, and guitarist Pat Smear slowly march across the rather enormous main stage that must have spanned across at least five hundred feet, not including the equally-long extensions on either side of the main platform. 36,000 people started screaming their heads off. The Foo Fighters were clearly the headliners. There was no doubt about that. What surprised me about the Foo Fighters’ performance was not their unmatchable musical talent, because I was well aware of that, but rather their tendency to jam throughout a lot of their songs. This routine actually started during the outro of the opener, “All My Life.” As the band continued, outros were extended, interludes between verses became long guitar duels, songs ended by a slow, fading guitar solo rather than a brisk, full-band “BLAM!” as they might on a studio recording. Dave Grohl, in a moment of supreme improvisation, snuck a piece of 2002’s “Times Like These” into “These Days,” one of Wasting Light’s singles, declaring that he “was looking down at the setlist during ‘These Days’ and realized that ‘Times Like These’ wasn’t there.” That’s really the kind of performer Grohl is. He’s a really down to Earth, relaxed guy who just wants everyone, including the band, to have the best time possible. And let me tell you: he was more than successful. The Foo Fighters played for a solid two hours on the main stage at the 2012 Bamboozle Festival before helicoptering into New York City to back Mick Jagger on the season finale of Saturday Night Live. The only song I wish the band played was “Bridge Burning,” Wasting Light’s opening track, which starts the album off with an attention grabbing harmonic that sounds like Grohl tearing his guitar in half. Presumably, the band was only opening with that because they had been playing Wasting Light in its entirety before pleasuring the audience with a series of hits. The Foos surprised me further by tossing in one of my favorite deep cuts, “Hey, Johnny Park,” as well as setting new standards during a cover of Tom Petty’s “Breakdown” as well as a cover the first track of Pink Floyd’s classic The Wall, “In the Flesh.” I am not exaggerating when I say that the Foos’ version of “In the Flesh” was as good if not better than the original, especially when drummer Taylor Hawkins took over on vocals. And that wasn’t even the first time Hawkins sang that night. The band also performed “A Cold Day in the Sun,” the one Foo Fighters song on which he always sings. Hawkins usually drums and sings on “Cold Day,” but we got the privilege of seeing Dave Grohl sit down at Hawkins’ beautiful, drum set and blast through the mellow number. 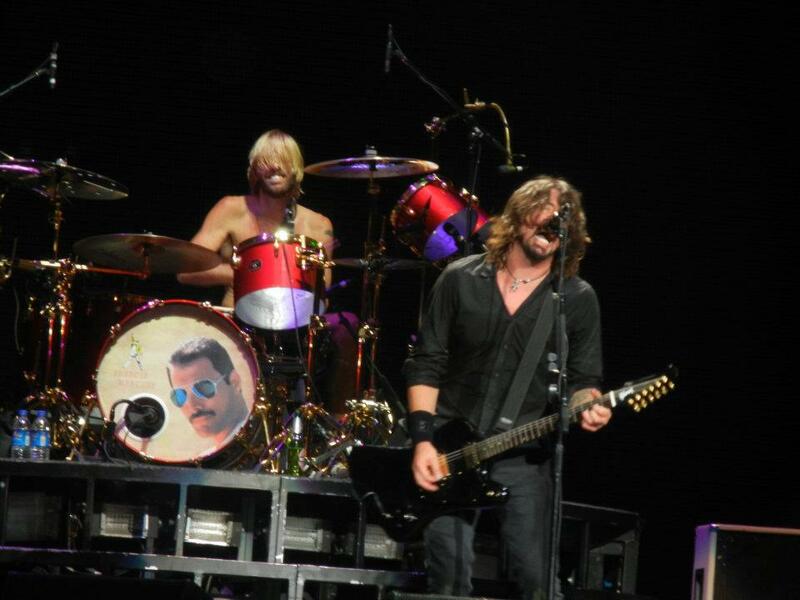 Taylor Hawkins really stole the show, though. I’ve never seen a drummer play so exuberantly and perfectly. If the studio version of a song has a moment of pure rhythm, Hawkins played a magnificent fill instead live. In fact, the whole band showed me and the other thousands of audience members why they are one of the biggest rock bands around. I can confidently say that the Foo Fighters put on the best show I have ever seen, such a position threatened only by the legendary Bruce Springsteen and the E Street Band. Few artists demonstrate such power on stage and I doubt that any new ones will come close to captivating audiences in quite the same way any time soon. If you are in fact in the position to see the Foo Fighters in concert, do not hesitate. Jump on that incredible opportunity.